Jersey head coach Harvey Biljon says he has almost finalised his squad for the 2016-17 Championship season. The fifth-placed islanders could still make the play-offs but will not go up to the Premiership if they are successful as they do not have a suitable ground. "We're three players away from finalising the squad," said Biljon. 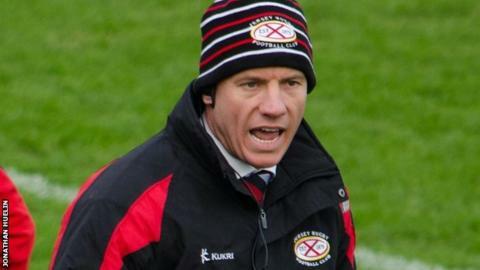 "It's crazy to think that we've already finalised our squad at this stage of the season," he told BBC Radio Jersey. The club need to strengthen their front row, with loose-heads Sam Lockwood and Ignacio Lancuba both leaving this summer, but 19 players have so far committed to deals for next season. "I've got people in mind, but we've probably got about 10 or 12 candidates to fill those three places," said Biljon. "We've just got to make sure we get the right players, not only for Jersey as an island, because it's a unique place, but how they're going to fit in and how we find that balance with the squad." But Biljon admits that he has missed his target of making no more than eight changes to his squad this summer. "I think there's going to be more than that," he said. "But I think when we look at it, probably six or seven of those changes are out of our hands, they're players going to the Premiership, it's personal reasons, or potentially a Will Rowlands or a Tom Howe being called back to their Premiership clubs. "We'll probably find ourselves in a position where there are 10 or 12 new signings. "Is that by design? Not really, as you want to keep the continuity together, but that's the nature of Championship rugby, you're always going to have players going on to different things and you have to strengthen your squad with what you think the best balance is."